Juanita and William met online a little over 6 years ago. They were both new members, met nearly immediately, and both deleted the website a month after they began dating. While hosting a housewarming party for a new place thy bought together, William had secretly planned a proposal and asked the question in front of their children and family and friends at the party. 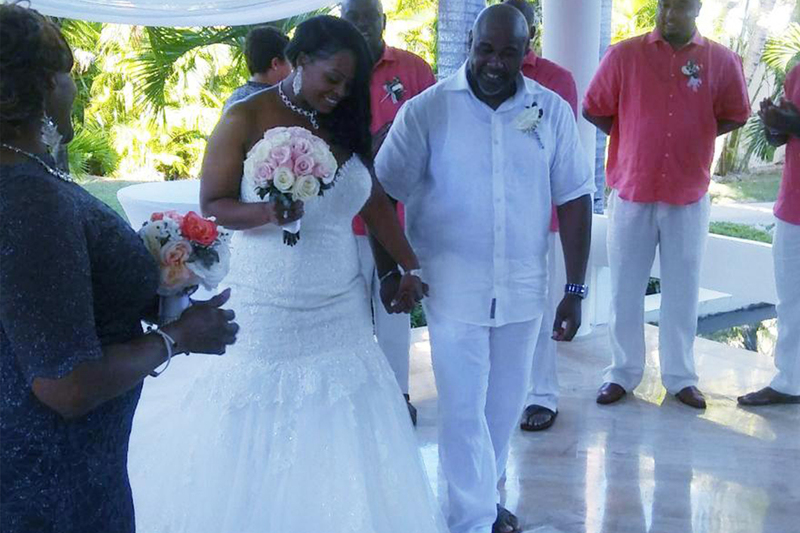 They chose a destination wedding after researching the costs of a local wedding. The couple said quotes were ridiculously high, with estimates around $30 grand and not including the cost of wedding attire or food. William said, “The price tag kept going up.” Together with their Destify agent Brittany, they researched Punta Cana. After a friend had returned from Melia Caribe Tropical they knew it sounded like the resort for them. Initially, the coordination process was less than ideal. The resort’s wedding department was slow to respond, and they switched through several coordinators. But once on-site their worries were put at ease with their coordinator Rose. Juanita said, “She took over and took care of everything.” They went through a ceremony rehearsal, and Rose was great at coordinating the procession and organization of the ceremony. Before their wedding, they held a dinner rehearsal for friends and family at one of Melia’s restaurants, where the staff surprised them with a cake. On the day of the ceremony, Juanita’s hair and makeup were taking longer than expected, but Rose kept their guests entertained and the beautiful ceremony went off perfectly at the resort’s beautiful wedding gazebo. Despite the planning hiccups the couple loved their ceremony, and the special time it carved out with their families and closest loved ones. Reflecting, the couple recommends having a clear idea of what you want in your wedding, and to stay on top of your wedding department. In the end, they loved how a destination wedding turned out to be a great way to save on a vacation, especially for guests with children. It’s a beautiful setting, an intimate setting, it turns out to be just like every girl’s dream.